Today, during my run (I am forever reducing) I realized a truth about myself. As much as I loved fencing and despite my adventurous workouts with STPT, I have reached an age where I prefer sports to be more sedate. Or at least less sweaty and painful. I’m no good at tennis (and sweat too much while I flail away.) In the words of Teddy Roosevelt “I may not know how to shoot well, but I know how to shoot a lot” a fact readily verified by my hunting friends. I golf as I cook — that is, I’m great at slicing and improvising, not so good with rules and measurements. Petanque is loads of fun, but requires a court, few of which may (if any at all) exist in Richmond, but I am unaware of them. Sailing would be fun, but impractical and expensive given my location. Actually, I think it’s expensive no matter where you are located. Skiing isn’t year-round. Swimming — errr, I have a thing about public pools. 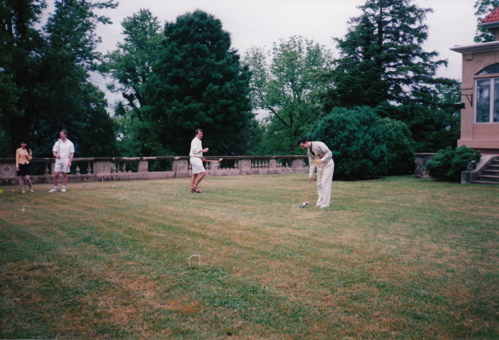 But casting my mind back a few years, I remember really enjoying a slow game of croquet. Yes, it was too cold and wet that day. But everyone seemed to enter into the spirit of the thing. Maybe because we’d made them drive an hour to Middleburg, VA. That’s a few of us in the photo above. 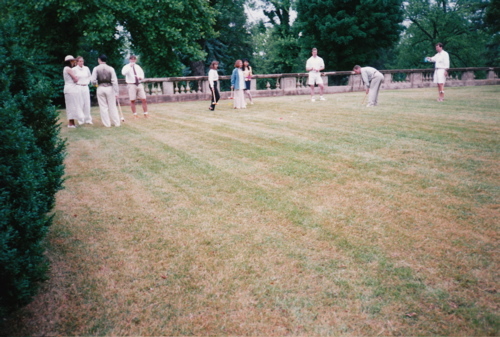 The other nice thing about croquet is that there is a dress code. And it’s fairly easy to play without spilling your drink. Which, some of you may argue, disqualifies it from being a sport at all. But it does have some sort of regulatory body and rules. Of which I am sure we were unaware. But I think that’s OK in a sport which cannot trace it’s own beginnings with any degree of confidence. So, I’ve cobbled together a brief history from a number of websites, each telling at least part of the story. In the dim and murky past, possibly as early as the 13th Century, croquet was invented by 1) the French, 2) The Irish, 3) The Swiss and 4) The Italians. Depending on whom you ask. It became very popular with women, who could compete on equal footing with men. Albeit during tightly chaperoned games. Although it did give canoodlers a chance to duck into the bushes when one sent the other’s ball rolling into the unguarded rough. In 1868, the All England Croquet Club was founded and leased four acres at Wimbledon. Chastleton House, in West Oxfordshire, also claims to hold the distinction of having the first ever croquet lawn, and is, apparently, where the rules of the game were finalised in 1865 (‘ish). Not long after, women began to lose interest in the game as it was becoming too rules-driven. In 1900, croquet was played at the Olympics in France. The French took all the gold medals and that was that for aspiring Olympic croqueteers (my term.) The game was never played at the Olympic level again. Unless it was played in 1904 at the Olympics here in St. Louis. We, of course, have our own rules and an American took the game. And croquet was never played at the Olympics again. I think. Croquet took off in the 1920’s, died back in the 50’s and enjoyed a resurgence in the 60’s. We attempted to win a Guinness Record for the longest croquet game ever down Monument Avenue in Richmond around 1988. Today, there are no fewer than nine variations of the game, played on five continents (the sun, at one point, never having set on the British Empire and all.) The Palm Beach Invitational was established here in 1969 and remains the longest running tournament in the U.S.A. .
St. John’s usually wins. This year’s match takes place April 20th. And the Middies have been practicing with a pro. Yes, this might be the year to break out the croquet set and head for the median of Monument Avenue. Significantly, the WCF doesn’t subscribe to the World Anti-doping Agency policies. Which means that you don’t have to hide your drink in the bushes and wait to be sent into the rough (non-existent on Monumnet, FYI.) Maybe it’s time to don the whites and take up the mallet again. This entry was posted in Entertaining and tagged Entertaining, games. Bookmark the permalink. My son and I play croquet quite often in the backyard. He’s five, so the game usually entails some sort of bizarre way of having to hit the ball. He also cheats heavily, so being able to partake in a cocktail is a requirement. I do think I need to go buy the proper clothing for it, though. Any excuse, I say. there’s always our family favourite: combat croquet. it’s a wicked, wicked game. Turling, that’s hilarious. If you google the St. John’s v. Naval Academy game, you’ll see a great photo of the Middies in full kit — a good look. The day we played I could have used a white letter sweater. Fairfax, The US Army used to have white combat boots for use in snowy conditions. A good vintage pair should serve you nicely for combat croquet. And remember, shoot around the cover, not over it, if possible. Loved this. Beautiful images. The game is big in my mom’s family — it really is great for all ages. I need to check out those images from St. John’s v. Navy.